This piano/vocal edition contains the piano/vocal sheet music for all of the songs from the CD, Beethoven’s Wig: Sing Along Piano Classics. 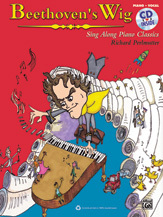 Each piece of sheet music is the original piano masterpiece exactly as composer wrote it, with Richard Perlmutter’s humorous lyrics and vocal melodies included for sing along fun! There are pieces for early intermediate to advanced pianists and keyboard fingerings are included on many of the works. As a bonus, this edition also contains the entire CD, Beethoven’s Wig: Sing Along Piano Classics. The CD contains all of the songs from the album, and includes the piano works without lyrics. The songbook contains extensive program notes with histories and anecdotes about each song, which are accompanied by humorous illustrations drawn by Perlmutter’s son, Sammy, who also did the songbook’s cover illustration. In addition, there is a foreword by the author, in which Perlmutter shares his thoughts about adding lyrics to works of classical music along with a short history of the practice. If you are a singer and/or pianist who would enjoy singing along with some of the greatest masterpieces of piano music in their original form, this book is ideal for you!